Our cooking teacher Ivy Chen's family is from Tainan on the southwest coast of Taiwan- where the 6.4 magnitude earthquake struck a couple of weeks ago. (her family is safe). One of the culinary specialties from that city is Danzai noodles- alkaline wheat noodles in a pork and shrimp broth with garnishes of minced braised pork, cilantro, bean sprouts, chopped raw garlic and a single perfectly cooked sweet shrimp. You also see versions with a hard boiled egg or a pork ball. Mrs. Chen started with a broth made from chopped pieces of bone-in pork leg simmered for a few hours. Then she pulled a ziplock of nearly black, gelatinized master stock out of her freezer and let it thaw. Master stock is integral to much Taiwanese cooking- being the base for braised meats of all kinds that end up in soups and other dishes. It's made by simmering cassia bark, citrus peel, star anise, garlic, green onion, dried mushrooms and sugar in water, soy sauce and rice wine. Various meats are then braised in the stock until tender. Instead of being discarded, the braise liquid is retained and either kept at a boil, chilled or frozen for later to braise more meat for other projects. In this way, the flavor of the stock continues to deepen with time. Master stocks are sometimes kept going for decades. To make the Danzai noodles, we added ground pork and a bit of minced belly to Ivy's master stock and simmered for an hour. We took the fresh pork leg stock made earlier, got it boiling and added shrimp heads and shells. We bought fresh noodles from the local market since we were already making two other kinds of dough for steamed buns and Xiaolongbao and were running short on time. We blanched them briefly and slipped the hot noodles into bowls, ladled the shrimp and pork stock over and then topped it all with the pork braised in master stock, bean sprouts, cilantro and a bit of chopped raw garlic. 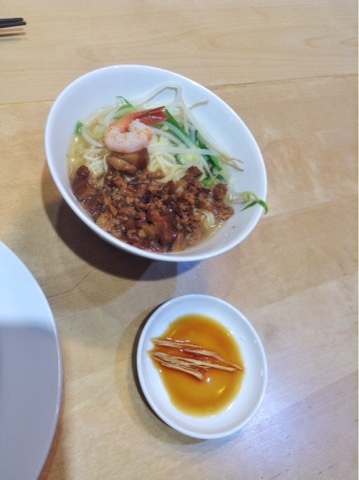 Danzai noodles are usually eaten as a snack in a small bowl. It's a simple and insanely delicious thing, that raw garlic really brings all the flavors together. Mrs. Chen suggested that if we wanted to try some other versions of Danzai noodles in Taipei, there was a great authentic spot in an alley behind Din Tai Fung. 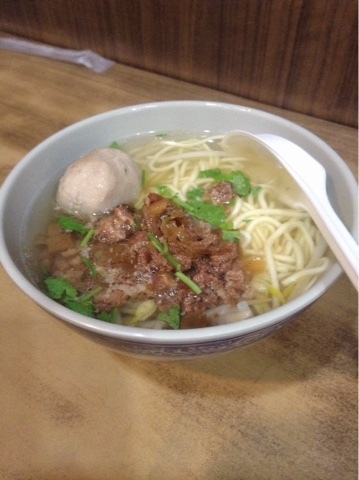 We went searching the next day and found a shop that specializes in Tainan noodles. We enjoyed small bowls of Danzai that were quite similar to Mrs. Chen's- maybe not quite as good. The shrimp was replaced by a savory, rubbery pork ball. I emailed Mrs. Chen and it turned out that we'd gone to the wrong place. That was still a fine bowl of soup. Such is the food in Taipei that you have to work to find a bad meal.